Jensen Ackles is rumored to be attached to the 2010 movie Resident Evil: Afterlife with Milla Jovovich (confirmed) and Eva Mendes, Ali Larter, and Jason O'Mara (all rumored). I haven't been a huge fan of the RE movies, but I did go see Resident Evil: Apocalypse becuase Oded Fehr was in it. How can I do less for Jensen? Jensen also gets a mention in this We Are Movie Geeks article about making a movie about The Flash. It's a brief mention, referencing Jensen losing the Green Lantern casting battle as a popular underdog, with a half-sentence speculation about his suitability for this role. I also saw some polls including him for the Captain America role, which of course is fan speculation rather than industry info, but it's fun to contemplate. I for one would love to see either J get a superhero gig. Or a romantic comedy, for pity's sake! 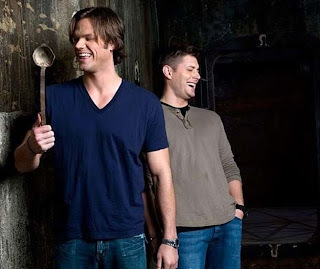 Two Entertainment Weekly issues ago, the Must List contained a reader-supplied description of Supernatural. It would be nicer if they'd mention the show every week in the Must Watch section (which they did do in the latest issue), or even half as often as they talk about Gossip Girl, but every little mention helps! Alan Tudyk (Wash from Firefly, Alpha from Dollhouse) and Adrianne Palicki (Jessica from Supernatural, Tyra on Friday Night Lights) are dating! Adrianne is also currently filming Red Dawn with Jeffrey Dean Morgan. 2010 conventions are being announced all over the world! In the U.S. (+Vancouver), Creation Entertainment has the most events. They've got Chicago this November, then LA, New Jersey, and Vancouver scheduled for next year. (LA and Vancouver sold out their Gold Package tickets already!) There will also be Jus in Bello in Rome in April, Brazil in May, and Asylum in the UK, also in May. A source for lots of information on cons is the Supernatural Wiki. And finally, for those of you who aren't trying to keep completely spoiler free, this link has a clip and TV spot from this week's show. Jensen said on stage in Vancouver in August that all the talk about Green Lantern, Captain America and Resident Evil are just rumors. He's never gotten any calls, read any scripts for them or gone to any auditions. Jensen denied any ties to Resident Evil, besides not having any time to film due to his current role on Supernatural, they hadn't contacted him. thank you for mentioning Jus In Bello Convention! Wow, isn't Alan, like, significantly older than Adrianne? She's only 24. Alan's 38 so it's not like he's ready for the walker quite yet. He was just awesome on Dollhouse and of course I adore Wash. Now if only we can get the boys to be shirtless more often. I don't think that's too much to ask. I'm with you on the shirtless, but Sam's sideburns have got to go. They're a little too Zoolander for me. Thanks, smantha and phoe, though I don't think "wishful thinking" is the right way to put it, at least not for me. :) I realize I didn't put that my source for the RE rumor was IMDb--I don't know where they got it originally or why it hasn't been changed since August. I also indicated the others were not active rumors. Maybe someone should get a petition to get Sam's sideburns removed and of course slip in a clause to have the boys shirtless more. Hell have one layer more too since I'll take what I can get.